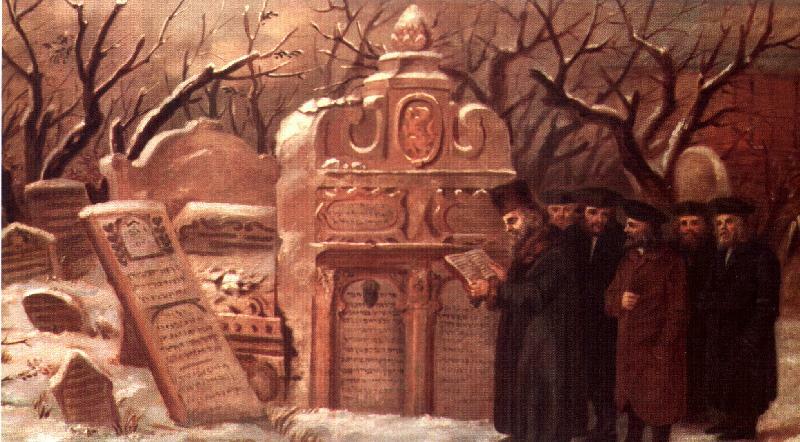 The annual prayer at the Maharal grave (Rabbi Yehuda Low of Prague, 16th century), picture of Hevra Kadisha Prague, around 1830. The picture is from the book: "Mifgash Ha'tefusoth" (the story of the Czechoslovakian Jewry), editor: Natalya Berger, Beth Hatefusoth and the Ministry of Defence, Tel Aviv 1990. As we all know the Jewish Museum in Prague has a large collection of Jewish records going back well into the 18th and in some cases into the 17th century. In JUDAICA BOHEMIAE Vol. VII , Jan Herman published under the Title: The Jewish Community Archives from Bohemia and Moravia a detailed description of these holdings. This important publication is available in larger Jewish and University libraries. The contents of the archives are divided into three analytical tables. The most important one is table Nr. 1. It is organised by community, type of record and timeframe.The table is divided into 42 vertical columns. Following is a description of the content of these columns. Please note that the items listed below are under the control of the Jewish Museum in Prague with the exception of colums 25, 26 and 27. These are the birth, marriage and death registers which have been transferred to the Czech State Archives. Many of the records listed are not at the Museum itself and it is necessarry to request items in advance. A typical entry: BRNO: Vertical Column 6: 1848-1936. This means that for this community the chronicles and historical references to local Jews are available for the years 1848-1936. The constitution of the Jewish community, and its regulations, including material concerning the founding of the community or the legalization of an existing community. The area of the community, including the names of incorporated localities, the amalgamation of several communities into one, or the division of large communities into several smaller ones. Minutes of meetings and invitations to meetings of the elders. Chronicles and pinkas books, for the most part old volumes, or books from smaller communities where the whole business of the community was recorded. Statistics: lists of members of the community, employees of the community, names of Jews from elsewhere, lists of Jewish names. Elections to the organs of the community and to regional and state organs. Registration of incoming material, minutes, lists of documents in the registry before deposition in the archives. Registry. In some communities documents were filed according to the registry number for incoming material and not according to the subject dealt with; in such cases the material is found in column 9. Where material was filed according to subject matter, it can be found in cols. 11, 14-20, 22-24, or 28. Registry material usually comprises letters received, copies of letters sent (or a book of copies), orders and decrees received, circulars, material concerning compulsory mIlitary service, certificates of respectability and of indigence, times of prayer-meetings etc. Postal delivery bocks: lists of documents sent by post or delivered by hand. Religious matters: concerning the local rabbi, relations with the regional and district rabbis (personal papers will be found entered in col. 15). rabbinical qualifications, the religious premises belonging to the community, such as the mikvah, the beth hamidrash, etc. :the kosher butchery, synagogue services, services for the military and the election of rabbis. Mazkirim (books of prayers in remembrance of the dead). Sermons, speeches etc. Special sermons by the local rabbi. political and other speeches. Social care: care of the sick and the poor, assistance, efforts to aid the distressed, old people's homes, hospitals, poor-houses, alms, care of soldiers, of orphans, of beggars. Care of refugees (war victims, refugees from Nazism and from pogroms). Distribution of Passover flour, mazot and etrogim. Personal papers of community employees, their enrolment and dismissal, and salaries. 16. The Zionist movement and aid for Erez Yisrael. 17. Land owned by the community, excerpts from the land-rolls. 18. Real estate owned by the community, the maintenance, sale and purchase of such property, builders' and other plans. Plans of the Jewish community. Privately-owned Jewish houses, letting of properties and flats. 19. Antisemitism and persecution of the Jews. The Nazi persecution, emigration caused by pogroms and wars, antisemitic literature, anti-Jewish campaigns. Limitations placed on the Jews and persecution beforeemancipation: anti-Jewish measures taken by the Church, enforced concentration in ghettos, reduction in the numbers of Jews, and their expulsion, complaints against Jews and government protection of the Jews. 20. The finances of the Jewish communities. Budgeting income and expenditure, statements of balance of accounts, bank business, insurance of community property, loans, cheque books, receipts, bonds. Donations to the community, collections organized by the community, and other accounts. 21. Catalogues of community property. 22. Endowments. The management of endowments, legacies and estates. 23. Taxes. The religious tax (after emancipation), state and local taxes, War loans (World War I), military requisitioning. The military rates, Feudal taxes and rates (before emancipation): tribute, serf labour tolls, feudal officials' salaries, domestic salaries. payments in kind, exemption taxes, consumption taxes, etc. 24. Register documents. Birth, marriage and death certificates, marriage business, permission for marriage, banns. Change of name. 28. Entrance to and withdrawal from the religious community. The acceptance and expulsion of members. 30. Books, lists and plans of seating in the synagogue. 31. The synagogue: building matters. Purchase of land and buildings. Repairs, demolition and sale of synagogue buildings. 32. The synagogue: official books and registry material. Minutes of committee meetings. invitations to meetings, regulations, correspondence. 33. The synagogue: business matters. Account books, bills etc. ; lists of donations, of donations on calling to the Torah, of members subscriptions, rental of seats, pinkas and miscellaneous expenses. 34. Inventories of synagogue equipment. Lists of articles for religious use. 35. The burial society: constitution and regulations, agenda including relevant correspondence. 36. The burial society: lists of the deceased and of graves, plans of graves and copies of epitaphs. 37. The burial society: official books and registry material. Correspondence, lists of members, invitations to meetings, minutes, chronicles, establishment and abolition of cemeteries, election of burial society organs. 38. The burial society: business. Account books, bills etc., lists of donations, lists of subscriptions and gifts. Purchase and sale of land for cemeteries, building matters. Pinkas. Endowments. Taxes. Inventory of burial society property. Burial taxes and the sale of plots for graves. 39. Educational matters. Religious instruction. The Jewish school and its registry, inventories of equipment, school business, school chronicles, building matters, school fees, teachers' and pupils' library catalogues, chronicles, books of honour. The Talmud Torah school. Local school board. 40. The school: class registers, lists and qualifications of pupils. Catalogues. 41. Official books and documents concerning local Jewish societies. 42. Private papers. For the break-down of this material see Analytical Table 3. List of Jewish institutions and societies whose written archive material has been partially preserved among that of the Jewish religious communities of Bohemia and Moravia (mainly fragments of correspondence between the institution (society) concerned and the appropriate Jewish community. Table 2 breaks down the data found mainly in cols. 9, 14 and 20 of Table 1. Local societies (col. 41) are not given in this table. The name of the Jewish organization or society is followed by the name of the place in which it functioned (where that could be ascertained), and the name of the Jewish community in whose archives the material was found. This index of names consists essentially of a breakdown of the data found in columns 19, 22 and 42 of Analytical Table 1; the material consists mainly of omplete collections of papers, endowments and individual correspondence.